Cosmas and Damian were twin brothers. They were born in Arabia and raised to know and love Jesus. They became very skilled doctors, treating many people without ever receiving any money for their work. Cosmas and Damian were tortured for believing in Christ, but they never got so much as a scratch or a bruise. Finally, they were beheaded. 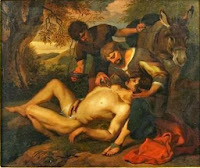 But even after they died, Saint Cosmas and Damian cared for people. Once when a man was going on a long trip without his wife, he prayed and asked the brother saints to watch over his wife. Sure enough, a criminal tried to kidnap and kill her. But two angry men appeared and scared him away. The men brought her safely home, and when she asked their names, they said they were Cosmas and Damian and instantly disappeared. In honor of these two doctor saints today, pray for all the doctors, nurses and other medical professionals that help take care of you and your family. Then pray for them again – twin prayers on the feast of twin doctors! Saints Cosmas and Damian, pray for us!